Mesilla Blog » Happy New Year! 2006 ends in a few hours and 2007 begins. A traditional way to celebrate the start of the new year in this former Spanish colony is to set off fireworks. The City Fathers have been trying to squelch that behavior for years. 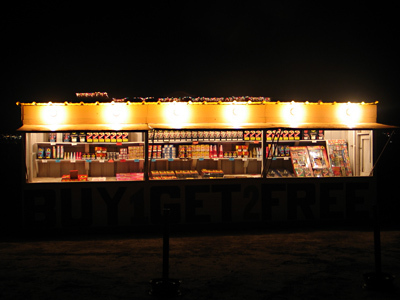 Here’s a lone fireworks stand in Mesilla, selling the bland, “safe” fireworks permitted by current law.